Mn/DOT is hosting regional open houses this month and needs to hear from you. The dynamics around this issue are changing rapidly. There are new developments at local, state and federal levels on a regular basis. The Alliance's advocacy efforts continue to gain attention and our support is growing. Significant rail investments have a multi-generational impact, so they need to be informed by a long-term view of how best to serve the most people and create the most benefit for our region and state. Rochester offers the best route option because it will serve the region’s long-term needs, benefit the statewide economy and contribute to the viability of a Midwest system. In addition, Rochester-area leaders have been interested in passenger rail service for many years and residents throughout southeastern Minnesota strongly supports a Rochester corridor for service between the Twin Cities and Chicago. 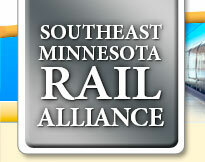 We are seeking interested citizens and organizations from all sectors throughout southeast Minnesota interested in advocating for high-speed passenger rail to serve the entire region. Sign up to get our updates and learn more about how you can get involved.